If there is one kind of tree most of my clients ask for, it’s an apple tree. If you’re lucky enough to have the space for an orchard, there are many magical ways to incorporate such a wonderful feature, but even much smaller gardens can accommodate a fruit tree or two with careful planning. When you don’t have time to tend beds of vegetables, an apple tree is a great way to include a productive and edible element to your garden, and it’s probably the best choice for a home garden as apples tend to fruit more reliably than other fruit trees in this part of the world. To my mind, the apple blossom in spring is reason enough to grow them even without a crop of apples to look forward to! If you’re thinking of adding a fruit tree or two to your garden, September is a great time to choose, as this year’s fruit ripens on the trees. You can’t beat home grown fruit for freshness and flavour, and the varieties sold in supermarkets have been bred for other considerations, such as shelf life, heavy cropping and the standing up to travelling long distances, so they just don’t have the aroma and flavour of older varieties. If you’re lucky enough to have a farmer’s market near you, you can try the varieties on offer there and see what appeals to you. It’s also worth checking out Irish Seed Savers (www.irishseedsavers.ie ) who have a great selection of heritage varieties hard to find anywhere else – you can visit their gardens and orchards and choose for yourself and there’s lots more to discover on a family day out. Do remember when selecting your tree that you usually need two different varieties planted near each other to ensure pollination and, subsequently, fruit – and they need to be in blossom at approximately the same time for this to happen. 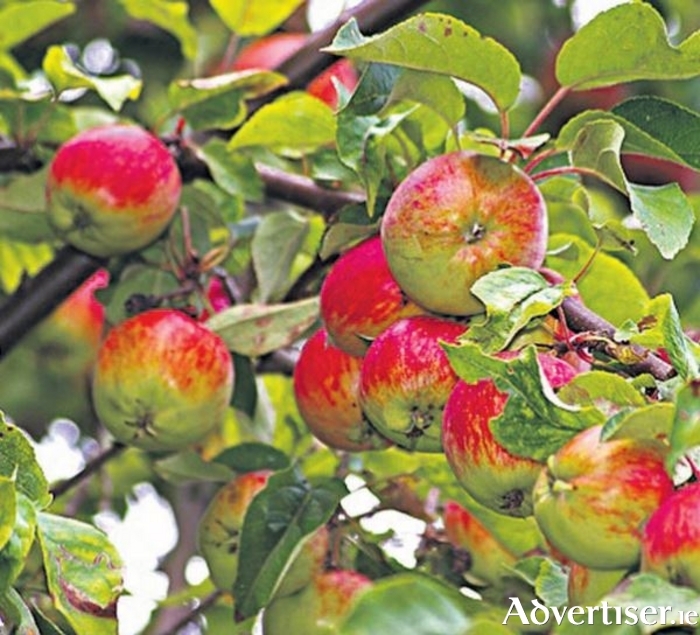 Some varieties, such as the Bramley cooking apple, are even more fussy – being a triploid variety, this needs two other varieties to pollinate it and ensure a crop. Do seek advice at your local garden centre when buying your tree as they should be able to advise you on which varieties make a good team. If space is an issue though, there are ways you can get around this – for instance a tree in a neighbouring garden might be able to oblige, and you could consider a ”family” tree – this is a tree on which two or more varieties of apple have been grafted, so you don’t need to worry about pollination and you can enjoy more than one kind of apple at cropping time. When planting your new apple tree, add plenty of organic matter to improve the soil, stake securely and water in well. Make sure you leave a square metre or so around the trunk clear of grass (a good thick mulch will help ) while the tree is young to give it a chance to establish. And remember to enjoy the apple blossom next spring!